Proposals for a residential development at land to the south east of Brackenborough Road, Louth have now started to take shape as the landowners prepare to hold a public exhibition next month. The public exhibition will reveal an illustrative masterplan for the scheme which will show the development of up to 500 new homes, which will provide a wide range of opportunities for home ownership, ranging from detached five bedroom family dwellings to two bedroom semi-detached starter homes. It will also include affordable housing. The masterplan includes the provision of over 18 acres of publically accessible green space which will include children’s play areas, biodiversity enhancements, sustainable urban drainage features and a series of attractive landscaped walkways around the site. The exhibition follows an initial community consultation in December 2015 which sought views from local residents on the draft proposals. A spokesperson on behalf of landowner and applicant Metacre Ltd said: “The intention has been to create a high quality, attractive development set within a network of green spaces. Metacre’s planning consultants, De Pol Associates are in the process of preparing details of an outline planning application that will be submitted to East Lindsey District Council in the summer. 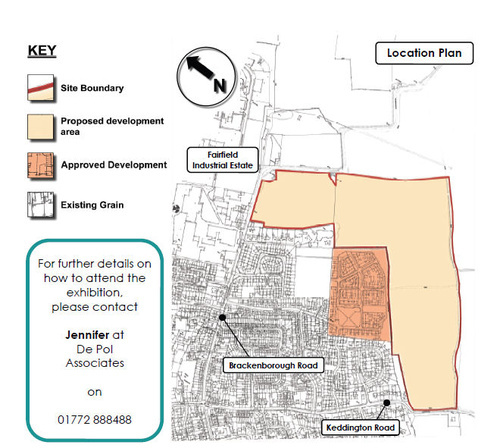 Alexis De Pol of De Pol Associates said: “There is an acknowledged need for new housing in East Lindsey and Louth has been identified as a sustainable location where some of this housing growth is to be directed. Over the past few months a wide range of technical survey work has been undertaken to ensure that any potentially adverse impacts resulting from the development can be minimised, including highways, drainage and landscape impact. The scheme could deliver much needed new homes in Louth, contributing to both local and District housing needs. The exhibition will provide a further opportunity for the community to share their views on the proposals prior to a formal application being submitted to the Council. For further details of the event you can contact De Pol Associates on 01772 888488.